Note: See the progression of this work in a series of summer video blogs (vlogs), as mentioned in this article. See the Web Extras feature below for the clips. This past summer, New York Sea Grant (NYSG) Hudson Estuary Specialist Nordica Holochuck hosted a Cornell University College of Agriculture and Life Sciences (CALS)-sponsored undergraduate intern in her Kingston office. It is the first time that Sea Grant has participated in the program, which matches students with on-campus faculty mentors and extension programs throughout New York. Holochuck worked with longtime collaborator Susan Hoskins, Geospatial Program Lead at the Cornell Institute for Resource Information Sciences (IRIS). “Susan and I were delighted to hire Bryan Chan, a Cornell Bioengineering major, to help us further develop geospatial training materials for Hudson Estuary educators,” said Holochuck. Chan’s summer internship was sponsored by Cornell Cooperative Extension. Since 2008, Cornell IRIS and NYSG have developed stewardship education materials to help educators better understand and teach students about coastal change over time in our NY-NJ Harbor-Hudson region’s urban coast and the resulting impacts to its coastal environments. “Based on our experience in previous workshops, we knew we had educational materials that engage teachers,” said Hoskins. In Summer 2013, NYSG’s Web Content Manager Paul C. Focazio will launch a digital version of the resources that will serve as the basis for teacher training workshops such as one in late-January at Queens College. These materials collected by Chan – historic and current aerial imagery, printed maps, video footage and Web-based geospatial resources – are from a variety of sites around the greater New York City region. These coastal wetland areas, which have been identified for restoration work by the NY-NJ Harbor & Estuary Program, include the iconic Liberty State Park; Staten Island's Arlington Marsh, a haven for harbor herons; and Sound View Park, home to the 24-mile Bronx River, NYC’s only fresh water river. With its south-end offering a connection to Long Island Sound, the Bronx River serves as a reminder that "we're all connected," said Holochuck. Summer 2013 Update: In the wake of Sandy in late-October 2012, Liberty Island (home to the Statue of Liberty, pictured here) and Ellis Island were both closed indefinitely while the National Park Service (NPS) assessed post-storm damage. Although the statue itself was not damaged by the storm, Liberty Island suffered significant damage to its infrastructure. Bricks were ripped up from pavements and Liberty Island’s dock, where tourists arrive by ferry may need to be rebuilt completely. After months of repair to the island's damaged docks, energy infrastructure and security system, the NPS will reopen the Statue of Liberty on July 4, 2013. Last summer, New York Sea Grant (NYSG) Hudson Estuary Specialist Nordica Holochuck (pictured at far right) hosted Bryan Chan (pictured at far left), a Cornell University's College of Agriculture and Life Sciences at Cornell University (CALS)-sponsored undergraduate intern in her Kingston office. 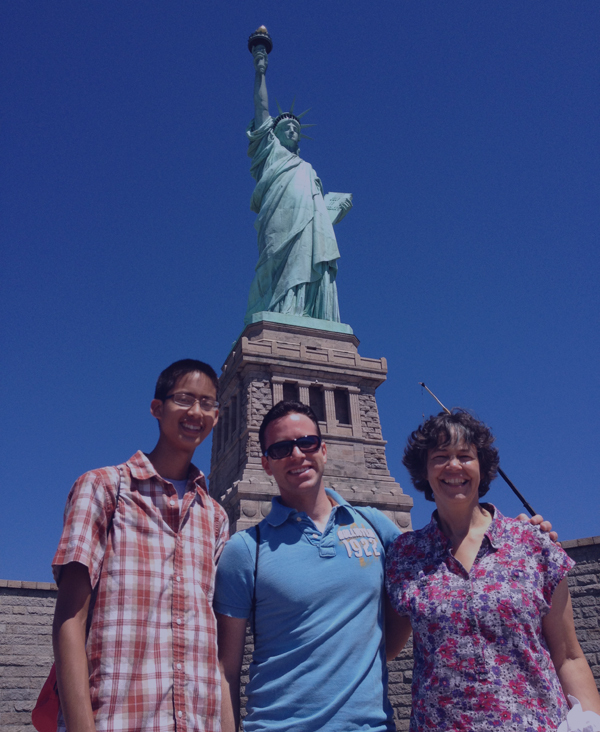 Chan worked with NYSG Web Content Manager Paul C. Focazio (pictured in middle) to develop educational curricula for a number of sites, including Liberty Island, as part of a Web-based mapping project on coastal change over time in NY’s urban environment. This content will be online in the coming months. Photo courtesy of Paul C. Focazio. Chan, a Hudson Valley native, also created some new and unique learning materials for places along the mid-Hudson Valley. He selected the Saugerties Lighthouse in Ulster County as a case study and also worked with Sea Grant’s Hudson River Research Reserve partners to create a stunning visualization of changes to the river shoreline along the upper reaches of the Estuary to be used in restoration related outreach and education efforts. Through collaborative efforts with Cornell and Sea Grant staff as well as targeted Hudson River Estuary stakeholders, “Bryan brought a whole new perspective to educator engagement with his skill set in video communications,” said Hoskins. “His video blog posts (Vlogs) provide a look at his internship experience, and a view of the dynamic Hudson River resource that we can share with educators.” Links to these Vlogs are available in the online version of this article. In the end, the key is to provide mapping resources from relatable areas that will interest the widest array of educators. “For someone who may be new to geospatial learning, it’s helpful to include relevant and important, even iconic imagery, such as the Statue of Liberty, that make the materials accessible to people outside of our immediate region,” said Holochuck. 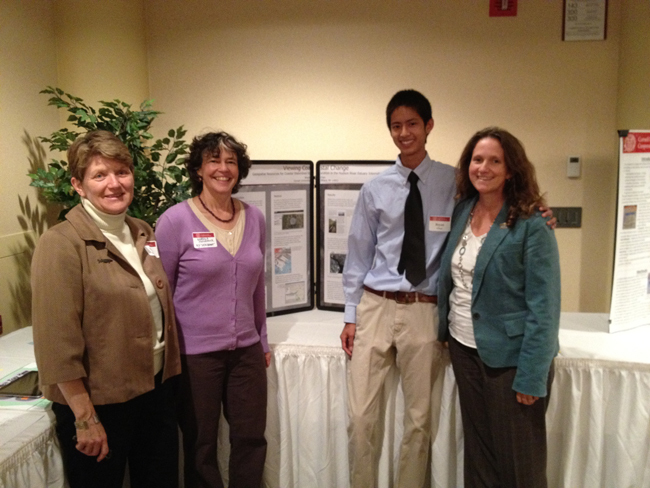 At the Cornell University College of Agriculture and Life Sciences (CALS) summer internship program reception in late-September 2012 (l-r) Susan Hoskins, Geospatial Program Lead at the Cornell Institute for Resource Information Sciences; NYSG's Hudson Estuary Specialist Nordica Holochuck; Cornell University CALS intern Bryan Chan; NYSG’s Associate Director Kathy Bunting-Howarth. Photo by Paul C. Focazio. In Summer 2012, NYSG Hudson Estuary Specialist Nordica Holochuck hosted Chan in her Kingston office. It is the first time that Sea Grant has participated in the program, which matches students with on-campus faculty mentors and extension programs throughout New York.